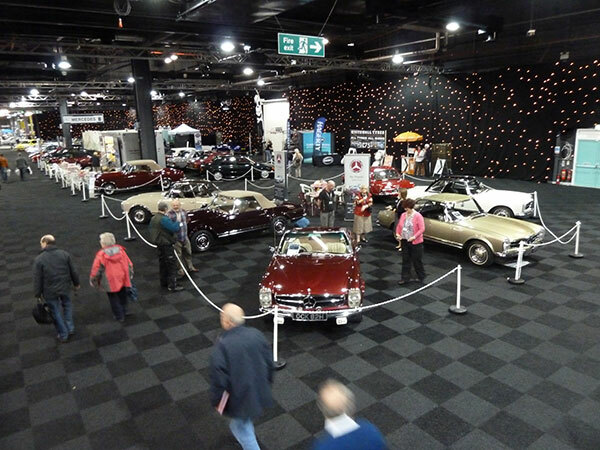 The Mercedes-Benz Club are looking forward to exhibiting at The Manchester Classic Car Show at Event City later this month. The Manchester Classic Car Show takes place during the weekend of 21st – 22nd September 2013. The venue is Event City at The Trafford Centre, Manchester. The show will be open from 10:00 hrs to 17:00 hrs each day and will occupy four of the halls within the complex. The Mercedes-Benz Club has a stand in Hall 4 on stand CS04 which is fully carpeted and is normally used as the Conference Hall within the complex. The Club Hospitality Unit will be on hand to enable members to relax and enjoy some light refreshments. The stand will feature a display of 13 cars which will include four Pagodas which are celebrating their 50th Anniversary since the start of production in 1963. We will have a 230SL, two 250SL’s and a 280SL in a variety of colours and all have gained awards over the years at classic car shows around the country. Other models on display include representatives from the W124 range (saloon and cabrio) both of which are very fine examples of their type. A very original W123 saloon and a 190E 2.5-16v Cosworth in flawless black paintwork, together with two AMG versions of a C36 saloon in stunning white and an SLK55 in rare jasper blue. The popular R129 range of SL’s is well represented by a red 300SL 24v and we have well prepared SL500 from the earlier range of R107 SL’s. The stand is complete with an extremely rare Ponton cabrio from the late 50’s.